Would you pass this chain letter on to three of your friends or neighbors? I have made the copies for you on my typewriter, to save your eyes. You will only have to mail the copies to friends, and mail my appeal to you, with ten cents, back to Madame Grosjean5—a fine woman, one of the exiles6. I am well and happy, working hard on my the proofs of my new book7. It will be out in the fall8. I go west for a few weeks late in the summer, probably September, and shall dash in for a look at you and a hug of you. Jack9 is doing so well! Document is one leaf, handwritten on recto only. Includes one envelope, handwritten. During World War I, millions of European civilians were displaced from their homes. Germany’s occupation of Belgium and northern France, Poland, and Lithuania caused a mass movement of refugees as indivudals fled violence and poverty. Though the details surrounding Madame Grosjean remain unclear, it is possible that she is a Belgium refugee, as Cather directly mentions the crisis caused by the occupation of Brussels in another letter (#0289). Song of the Lark was published in October of 1915. Cather, Frances Amanda Smith (1845-1922) (“Franc”). Cather’s aunt. Born in Boston, MA, Franc graduated from Mount Holyoke Female Seminary in South Hadley, MA, in 1870. Franc worked both as a private tutor and as a teacher at Winchester Female Institute in Winchester, VA. In 1873 she and George Cather married and moved to Webster County in Nebraska, where they raised their five children—Grosvenor, Blanche, Carrie, and twins Frank and Oscar. 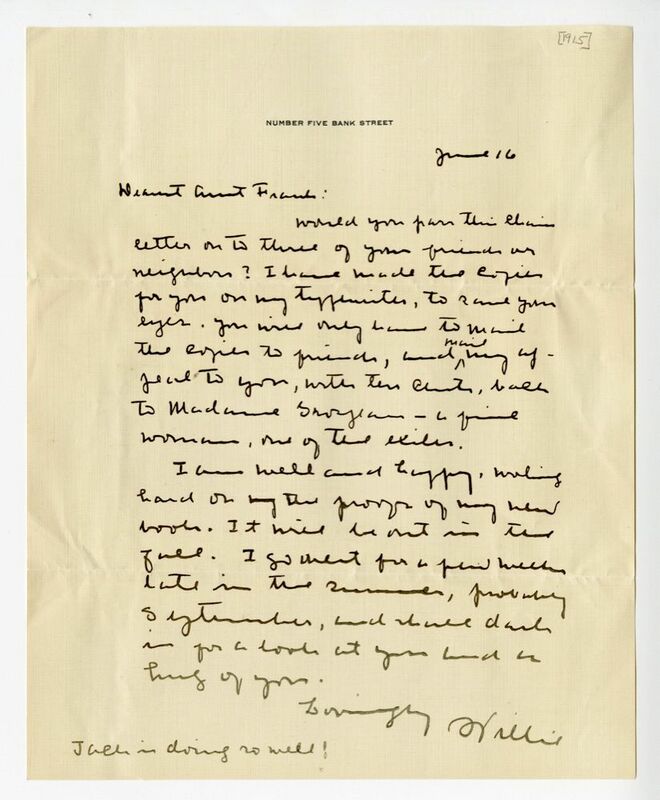 Willa and Franc Cather maintained a warm relationship and were regular correspondents until Franc’s death, exchanging letters about family matters and about Willa’s writing. Elements of the life of her New-England-born aunt inspired the character Aunt Georgiana in Willa Cather’s story “A Wagner Matinee” (1904), and Franc’s son Grosvenor was the prototype for Claude Wheeler in One of Ours (1922), making Frances the prototype for Claude’s mother, Evangeline Wheeler. 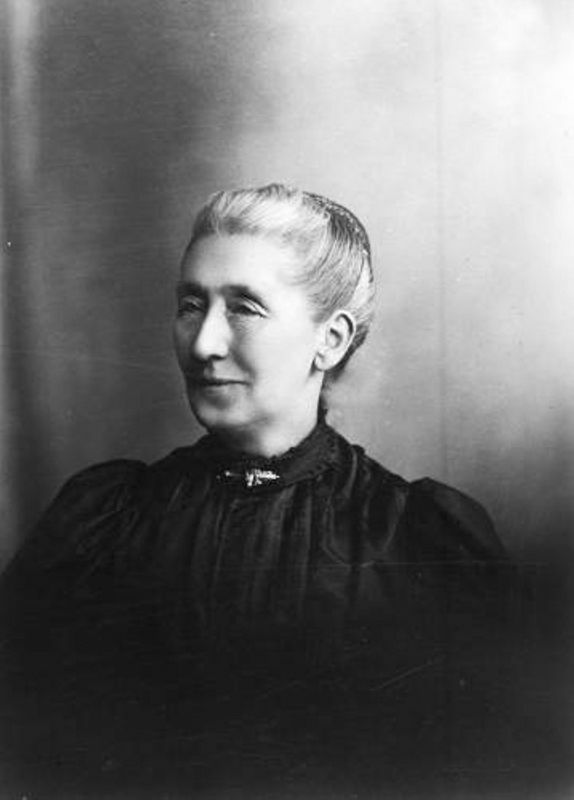 Madame Grosjean. A Belgian refugee. Madame Grosjean gave Cather a chain-letter requesting money for the cause of Belgian relief during World War One. No further information is available about this person.